A septic system is a two-part treatment and disposal system designed to condition untreated liquid household waste (sewage) so that it can be dispersed and percolated into the subsoil. Percolation through the soil accomplishes much of the final purification of the effluent, including the destruction of disease-producing bacteria. A septic tank provides the first step (through a series of baffles) in the process by removing larger solid materials, decomposing solids by bacterial action, and storing sludge and scum. The liquid between sludge (sinks to bottom) and scum (floats on surface) is then passed along to the leaching area for final treatment and absorption into the ground. 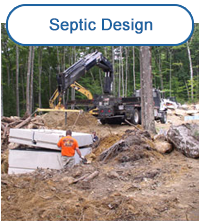 Why do I need a septic design? 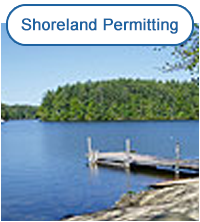 In order to obtain a local building permit. a state approved septic design must be provided. Initial Contact - Call or email the office to discuss the property. 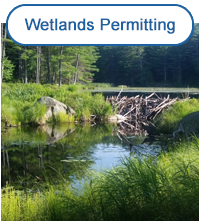 Site Inspection - A site inspection will be conducted to assess the property and identify any obvious issues, such as wetlands, streams and seasonal drainages, ledge outcrops, steep slopes, etc. Consultation - We will discuss the findings of the site inspection with you, and if you would like to proceed, a quote and questionnaire will be sent to you. Deposit - Upon receipt of a deposit, completed questionnaire and requested paperwork, the project will officially commence. Soil Testing - Suitable soils must exist where the leach field will be designed and constructed. Test pits will be dug with a backhoe in the area of the proposed leach bed to visually inspect the soil layers. A description of the soil layers, seasonal high water table and impermeable substratum will be recorded for each test pit. If problems are encountered, the client will be contacted and possible solutions discussed. 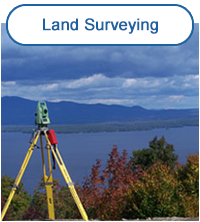 Topographical survey - Using a robotic surveying instrument, a survey crew will conduct a topographical survey of the property, which includes locating important landmarks and setting reference points. This information provides the basis for the septic design. The client and contractors can use it to lay out the resulting plan. Design -The field data is downloaded from the survey instrument to the computer and then plotted. A design is prepared in accordance with the client's requirements and local and state regulations. Final Plan - Upon completion, the plan will be sent to you for review, along with the necessary paperwork and final invoice. Once payment and paperwork are returned to Ames Associates, the plan is submitted to the town (if applicable) and then the New Hampshire Department of Environmental Services. Approval - You will receive in the mail the "Approval for Construction" from the State of New Hampshire. This typically takes up to two weeks from date of submission. Upon receipt of deposit, we begin the process. Within two weeks, you will receive a preliminary plan to review. Once final payment is received, along with the required paperwork, the plan is submitted to the town (if applicable) and then the state for approval. Towns' approval periods range from one to seven days and the state typically reviews a plan within seven days. You will receive by mail an "Approval for Construction" from the state within four weeks from the time a deposit is received, all requirements satisfied by the town and state departments.